Craving a light, summery dessert after dinner? 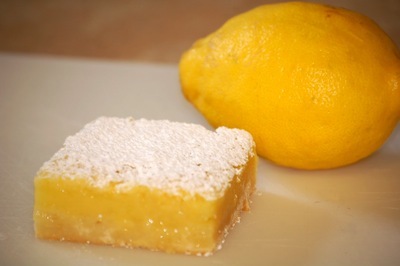 Don’t settle crumbly store-bought cookies, prepare a pan or two of these delicious lemon bars and pop the extras in the freezer for a quick craving crusher anything your sweet tooth starts to bite. If you’re into lemon meringue pie, you won’t have any complaints about these sweet and tangy treats. Keep reading to find out how you can transform this recipe into Almond Amaretto Bars or even Cherry Bon-Bon Bars, and click here to request a free food sample from Passanante’s Home Food Service! Blend margarine, salt, 1/2 cup powdered sugar, and 2 cups flour to make soft dough. Press evenly into an undressed 9″ x 13″ pan. Meanwhile, combine eggs, lemon peel, lemon juice, sugar, and 1/4 cup flour. Blend until smooth, then pour mixture over baked crust. Reduce oven temperature to 325 degrees and bake 25 minutes or until firm. Let cool, then dust with powdered sugar and slice into bars. Substitute Amaretto liqueur for lemon juice. After pouring filling over crust, sprinkle with sliced almonds. Substitute maraschino cherry juice for lemon juice. Chop well-drained cherries and add to filling. Melt semisweet chocolate and unsweetened chocolate with margarine. Spread over bars as a glaze. This entry was posted in Dessert, Recipes and tagged Almond Amaretto Bars, Cherry Bon-Bon Bars, Dessert, Lemon Bars, Passanante's Home Food Service, Recipe by Passanante's Home Food Service. Bookmark the permalink.